“The facts are that the programme is late, the costs are escalating, and in 2017 the cost of installing smart meters was 50% higher than the Department assumed. 7.1 million extra SMETS1 meters have been rolled out because the Department wanted to speed up the programme. The Department knows that a large proportion of SMETS1 meters currently lose smart functionality after a switch in electricity supplier and there is real doubt about whether SMETS1 will ever provide the same functionality as SMETS2. Issues: what will happen with the 12.5 million SMETS1 meters already installed? The first generation of smart meters, known as SMETS1 (“SMETS” being the Smart Metering Equipment Technical Specifications), is not currently enrolled in the DCC infrastructure which would make them fully operable with all suppliers’ systems. Currently some 70% of SMETS1 meters are likely to lose their smart functionality if the customer switches to another energy supplier. 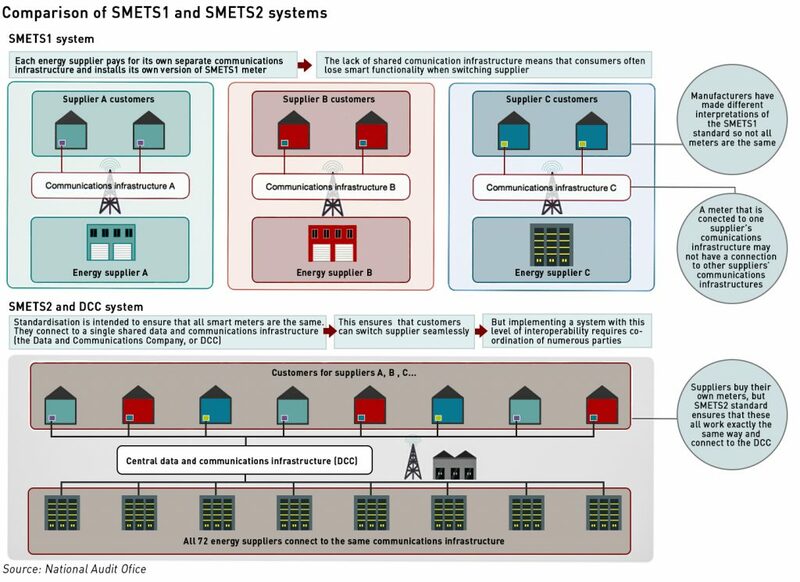 12.5 million SMETS1 meters have been installed so far, and BEIS has always planned that these would be enrolled to make them fully operable, however this is technically challenging, and the solutions are still being tested or in development. The target start date for enrolment has been constantly pushed back, and it is unclear whether all meter will be capable of enrolment. BEIS assumes that 2% of the first two thirds of SMETS1 meters will not be successfully enrolled but some stakeholders told the NAO that significantly more could fail. BEIS is also yet to decide if it will attempt to enrol all makes of SMETS1 meter, so any claims that the majority of SMETS1 meters will be able to achieve full operability should be treated with caution. However, this week BEIS and the DCC carried out a simulation that apparently demonstrates SMETS1 meters can be enrolled in the DCC. In the simulation, a household SMETS1 meter was enrolled onto the secure data network under a new energy supplier and tariff, easily and in a matter of minutes. Whether this is representative of all SMETS 1 meters is unclear given the fact that suppliers all developed different versions based on different interpretations of the specification. Issues: do SMETS2 meters deliver the promised functionality? The NAO believes it may take years before it is apparent whether the SMETS2 system works in its entirety. While the core communications infrastructure has been implemented and shown to work with a range of meters, the system consists of many interacting components, several of which are still being tested or have not yet been deployed or developed. So far no suppliers are offering prepayment functionality to those customers who have had SMETS2 meters installed, despite the fact that one in six consumers prepay for their electricity. The devices currently being deployed can only connect smart meters to in-home displays in up to 70% of properties. BEIS expects the technology to increase this to around 95% to be rolled out from next Spring, however the technology that would ensure all smart meters and in-home displays can be connected is still under development. Only 3,000 of the 109,000 SMETS2 meters deployed at the time of writing had been installed in the North of England and Scotland because of problems integrating smart meters with the DCC infrastructure in those regions. Recent press reports indicate that over 140,000 SMETS2 smart meters now been installed, however it appears that most if not all of these are part of pilot schemes. Until more units are installed it will be difficult to determine whether they deliver the full functionality as promised. The NAO believes the number of smart meters installed will fall materially short of the Government’s original ambitions, which initially set out that all consumers would have a smart meter by 2020. Suppliers are required under their licences conditions to submit rollout plans to Ofgem each year that either meet this target or explain why it cannot reasonably be achieved. In the most recent set of plans accepted by Ofgem, suppliers have indicated they expect to install smart meters in only 70% – 75% of homes and small businesses by 2020 due to limited consumer interest and delays to SMETS2. Actual rollout by 2020 may fail to reach even these levels if the DCC infrastructure encounters further problems or if suppliers consumers continue to be reluctant to accept a smart meter – while it is mandatory for suppliers to offer smart meters to their customers, the customers can decline the offer and continue to use traditional meters. Indeed, recent analysis by consumer group Which? indicates suppliers are significantly behind schedule for the roll-out and would need to install more than 30 smart meters per minute to meet the deadline. – Alex Neil, managing director of home products and services at Which? The Government has calculated that each year of delay in completing the rollout reduces net benefits by around £150 million, however, the NAO believes that the target is overly ambitious in light of the significant delays to the SMETS2 release. The pressure to stick to the 2020 date increases the risk of cost escalation and/or technology being rolled out before defects have been addressed, both of which would undermine the overall value for money for consumers. The costs of the programme have increased by at least £0.5 billion since the last forecast from BEIS in 2016, and could increase further. The 2016 cost–benefit analysis did not include the costs of the technical solutions for providing smart meters to the final 3.5% to 5% of properties due to lack of available information, however it is now thought this will add at least £0.2 billion to the overall costs. On top of which, Smart DCC is currently forecasting its costs to 2025 will be £0.3 billion higher than previously expected. This £0.5 billion increase in costs is equivalent to £17 per dual fuel household (in total, not annually) in addition to the £374 implied by the 2016 cost–benefit analysis. This is a conservative estimate which does not include direct marketing and consumer engagement costs incurred by suppliers to persuade consumers to accept smart meters, which can be significant – perhaps as much as £0.2 billion across the industry. 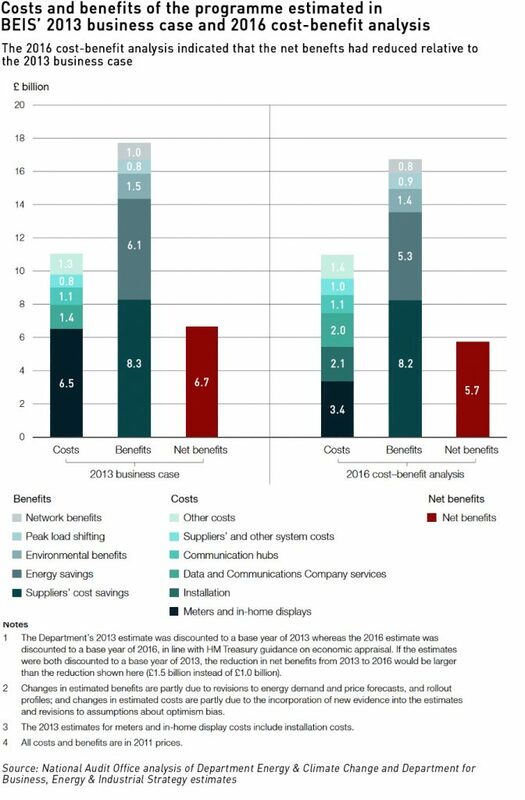 Costs will obviously increase further if SMETS1 meters require replacement, or if the cost of installation, which in 2017 was 50% higher than the BEIS forecast, does not fall. At the same time the NAO believes it is uncertain whether the industry cost savings forecast by the Government will materialise, or that any saving would be passed on to consumers. BEIS expects the industry to save money from smart meters and pass these savings on to consumers, offsetting around two-thirds of the estimated £11 billion cost of the rollout. These savings are expected to arise from reduced customer services costs since smart meters should reduce the need for call centres and other administrative overheads, (£1.2 billion of savings), while network companies would be able to use the newly available data make their networks operate more efficiently (£0.9 billion of savings). However, some of these savings may fail to materialise, not least because suppliers and network operators will be faced with a mixed SMETS1 and SMETS2 system, which will be more difficult than the predominantly SMETS2 environment originally envisaged by the Government. The NAO has identified some important gaps in monitoring information gathered by BEIS in terms of scheme performance. The last assessment of the costs of the rollout was in 2016, and excluded some costs as noted above, meaning the total costs of the programme are currently unclear. There is also no systematic monitoring of any energy savings being achieved through the deployment of the smart meters. A new cost–benefit analysis is planned for 2019 and including more information on energy savings. 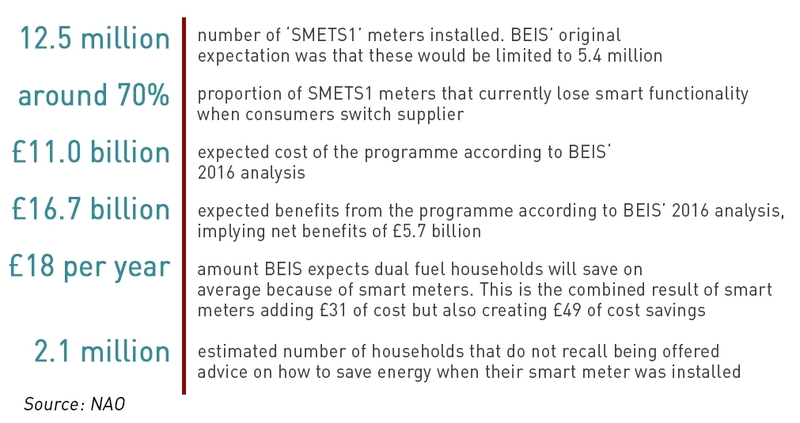 Even by the Government’s last cost-benefit analysis in 2016, the net benefits of the smart meters programme were extremely thin, and if all the costs of the scheme are properly captured in the next planned analysis, they could well disappear altogether. The Government describes smart meters as the “cornerstone of the smart energy system of the future”, however consumers are unlikely to be impressed if the predicted benefits evaporate and they are left footing the bill.